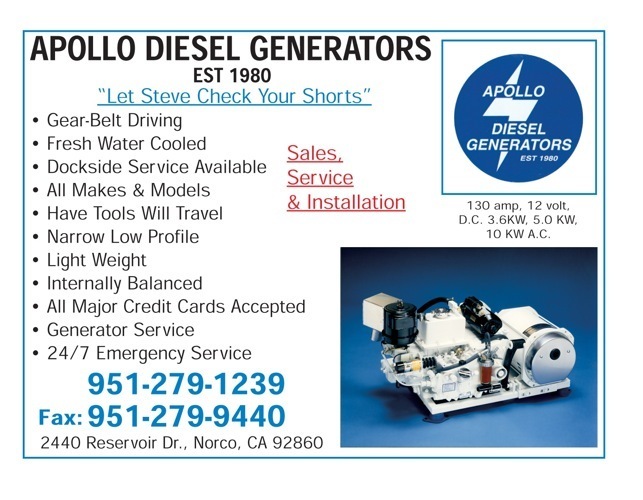 Thank you for your interest in Apollo Diesel Generator Solutions! Over the years, Apollo Diesel Generators has gained vast experience in the Marine and Land Generator Field. Apollo Diesel Generators is the manufacturer and has designed these Generators to be unsurpassed in performance, ease of operation and installation. Our Generators are compact, durable, self contained, simple and straight forward to operate and maintain. All of our Generators are virtually impervious to seawater corrosion. The Key to our success is the dedication we provide to our customers with State of the Art Diesel Generator Solutions. As it is a matter of Pride to us that all of our Generators meet the highest quality and reliability. Apollo Diesel Generators ensure that all Diesel Generators are produced to YOUR specifications.